His frame is sparse. He looks older than his 67 years. His white attire is crumpled and dirty. It is torn in a few places, indicating obvious paucity of finances. His long, flowing white beard gives him an ascetic look. He speaks in spurts. In fluent Tamil and faultless English, unexpected in one who did not even complete his schooling. He is a great accumulator of books on a variety of subjects. From philosophy to religion, law to communism, in addition to complete sets of the Encyclopaedia Britannica and Americana. He is capable of speaking at length on any subject. An ability that endeared him to several persons, notably the Archbishop of Madras. I have not had much by way of formal education. Only up to standard seven. My father was very poor and could not afford to educate his children much. He moved from his native village of Kannadikaathan in Ramnad district to Ceylon. It was there that I came into intimate contact with a college professor, A.H. Williams. He taught me English. He also introduced me to Christianity. I became so proficient in English that very soon, on my return to my native village, I was giving tuitions to some students. I read a lot of books on Christianity. I became convinced that Christ was the almighty God – the saviour of the world. I voluntarily converted myself to Christianity. Nobody forced me or compelled me. I changed my name to John Ganesh. I started addressing prayer meetings and preaching. I gained so much knowledge on the subject of Christianity that I was the main speaker at several conventions. The people so loved my talks that when it was advertised in newspapers, they just thronged to hear me. On one occasion, authorities even ran a special train to carry people coming to one of my meetings. My relatives did not object to my close links with Christianity because I was bringing in money. Though I was married, I was away most of the time and for the best part of 20 years, I had little contact with my family. I reached a stage when I knew Christian theology better than most priests. I knew the Bible word for word. During my travels, I met some Catholic fathers in Sriviliputhur. They were quite taken aback by my knowledge of Christian theology. One of them took a fancy to me. It was he who introduced me to Father Arulappa. This was around 1973-74. For the first three months Archbishop Arulappa treated me very nicely. I never even dreamt that one day he would misguide me. He used to frequently say: “Despite being Christians we do not have knowledge equal to yours on the subject. We are in a situation in which we have to learn Christianity from you. I was perpetually short of money those days. And he used to give me some cash off and on. One day, he told me: “You have tremendous knowledge. Now I want you to do something for me. I have a long-standing desire which you alone can fulfil and in the process, you will be able to do a tremendous service for the cause of Christianity as well. I asked him what he wanted me to do. He told me that he had written a book in Tamil, Perinba Villakku, in which he had propounded the theory that Tiruvalluvar was a Christian. I later found out that the book was not a popular one at all. That even today copies of it are gathering dust in bookstalls all over the country. He wanted me to do some work based on the contents of that book. 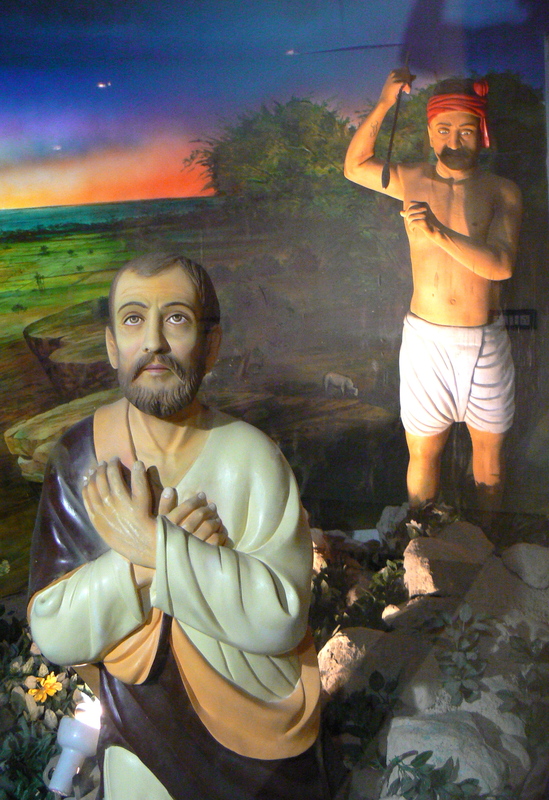 Though Tiruvalluvar and St. Thomas, one of Jesus Christ’s twelve disciples, had lived in different periods, he wanted me to unearth evidence to the effect that the two great personages had indeed met and that St. Thomas had converted Tiruvalluvar to Christianity and baptized him. He assured me: “If you do this successfully, both of us will become internationally famous. We will also get a lot of money. It will be very useful to you. I had misgivings about the whole project. Because I knew that in India there were no ancient documents or monuments on Christianity. Some documents are there, no doubt, to the effect that St. Thomas came to India. But doubts still persist whether the person mentioned in those documents is indeed apostle Thomas or his disciple. In fact, when some celebrations were held in Kerala over two decades ago, Jawaharlal Nehru, our then prime minister, who attended the functions, asked the learned priests who had gathered: “Is it really true that St. Thomas came to India? Nobody answered him. They merely smiled. They were unable to answer his query because they had no proof. When I told the archbishop all this, he said: If that is so, then we will have to concoct evidence to prove our point. Evidence like palm frond writings, copper plate inscriptions and all that. I did not like the plan one bit. But I wanted money. And this he promised to arrange for me. So I went along with him. The archbishop had planned minutely how this was to be done. It was simple but ingenious. Simply brilliant, if perverted. He made me cut brown paper into long strips – irregular and uneven like ancient palm frond scrolls. I then wrote whatever he asked me to on these strips. I adopted a scrawl that was similar to ancient writings – often indecipherable. And the style of language was also lifted from the past. Laborious and involved. These strips of brown paper were then pasted with glue on white cardboard and then photographed. The photo print looked exactly like a photograph of ancient palm frond scrolls. The archbishop intended to pass these off to unsuspecting people as the real stuff. I was still hesitant. But a friend, Santiago, who used to work in a bank, advised me to go ahead and comply with the archbishop’s request. I made several such photographs. Hundreds, thousands. Entire portions of Tirukkural were written this way and interspersed with Christian thought. He used to give me money for expenses. Five thousand. Four thousand. Ten thousand. Whatever was left, he told me, I could keep for myself. And make myself comfortable. The money, he told me, came from abroad. It was for the specific purpose of my research. And so there was no necessity to account the same to the Church. I had informed the archbishop that I was a married man. Because of financial problems, I am roaming around looking for some money, I said. I do not wish to get involved in something illegal. I do not want to get into trouble. And my family should not suffer on that account. Whenever I used to voice such misgivings, the archbishop used to reassure me: “Don t worry. I ll stand by you. No government or police will do anything against you. I will see to that. And no one in this diocese will dare do anything against my will.” He repeated this to me several times, holding my hands in his. He also used to consult me on several other matters. In the archbishop’s residential complex in Madras, there is an ashram called Shanti Ashram. This was actually constructed under direction from me. He used to tell me that I was to him what St. Paul was to Jesus Christ. To drive home the point he even began calling me Paul. He began introducing me to others as Acharya Paul. He told me that he had informed everyone that the research on Tiruvalluvar and St. Thomas was being done by Acharya Paul, a bachelor — a brahmachari. He requested that I keep up this pretence before others. But he gave me enough money to keep my family happy. This house in Srirangam in which I am still staying was bought with money given by the archbishop. I also purchased some jewellery for my wife and two daughters. I had an Ambassador car at that time. In addition, the archbishop gave me the car he was personally using. I did not pay him any money for this. But he showed in his books that he had sold it to me for Rs. 25,000. His constant refrain was: “You have whatever you want. But fulfil my life’s mission. You will not have any problems. I must have benefited to the tune of over Rs. 14 lakhs during my association with the archbishop. Many individuals in the Church resented my intimacy with the archbishop. I used to visit Madras frequently and on these occasions used to stay in some of the leading hotels there. The archbishop used to bear all these expenses. There were rumours at that time that some like Father D’Souza and Father Francis (the archbishop’s personal assistant) were likely to file a complaint against me before the police. But again, Father Arulappa assured me that no one under him would dare to breach his authority and file a complaint. He has even sent me letters which were seized by the police, to this effect. In 1977, the archbishop and I went to Rome. We visited the Vatican. And there I was presented to the Pope. The archbishop introduced me to the Pope as Acharya Paul, a great researcher who had done a lot to get at the roots of Christianity in India. He showed the Pope copies of some of the “documentary evidence” I had unearthed. Let me tell you one thing. The Pope, great man that he was, was not impressed. Though he was saying “very good, very good” all the while, he took the photographs in his hands, glanced at them and then just let them fall out of his hands. He did not care for them. Nor did he pay much heed to what the archbishop was saying. But he was very kind to me. Despite the fact that several dignitaries including heads of states were waiting for an audience, he spent about 20 minutes with me. From the Vatican, we toured several places in Europe and finally returned to India. I straight away went to my home in Srirangam. Since I did not hear from the archbishop for a number of days, I went over to Madras to meet him. It was then that he told me that during his absence, things had taken a turn for the worse. Someone had filed a complaint before the police, he informed me. “But there is no cause for worry. When the matter comes to court, I only have to say a word and the case will be dropped.” I worried a lot, nevertheless. Immediately after, the police came. They raided my house and searched all over. They seized all documents and letters pertaining to the case. And they arrested me and placed me under remand. They seized my bank accounts and interrogated my family members. I was made out to be a cheat, and a fraud. They even made out a case against me that I had taken a passport using a false name and a false address. In the passport my name was Acharya Paul, the name given to me by Archbishop Arulappa. The application had been made out by him and he had given my address as care of the archbishop’s residence in Madras. So what wrong have I done? But who would listen to me? Who was there to talk on my behalf? No one. Why? Because everyone had been heavily bribed. That is why. I understand that they gave away as much as Rs. 15 lakhs by way of bribes. In the metropolitan magistrate’s court, they convicted me to 10 months imprisonment. Later, in the high court, acting on a compromise petition filed, the sentence was reduced to 2 months. As I had already been under remand for nearly that period, I was let off. As part of the compromise, I had to forfeit all that I had earned through the archbishop – my money, jewellery, everything except my house which I was permitted to retain. I have no complaints about all that. What I feel sad about is that I had done all this at the instance of the archbishop who had held all along that he would help me out at the time of trouble. But he himself came to court and testified that I had duped him and defrauded him of money. That was the last straw. Originally published under the title “What Wrong Have I Done?” in The Illustrated Weekly of India, April 26 – May 2, 1987, Bombay. This entry was posted in christianity, history writing, indian history, madras-mylapore archdiocese, religion, san thome, santhome cathedral, st. thomas, thomas the apostle and tagged acharya paul, apostle thomas, archbishop mylapore-madras, chennai, christianity, ganesh iyer, indian history, madras, mylapore, r. arulappa, religious history, st. thomas apostle, thiruvalluvar, tirukkural. Bookmark the permalink.